I have a few issues with ReSharper 6 in my markup views that I'd like to address. 1. When using a virtual directory in IIS, ReSharper is showing an error saying the hard-coded path (e.g. C:\Code\Content\Images\MyImage.jpg) for my images does not exist. True - it does not exist, but the virtual directory maps it to a valid location. I had to turn this feature off. It would be nice to see if images were really missing in my virtual directory. 2. Is there a way to turn off the color picker feature? I find this very distracting and I would only need it seldomly (that's why I have Photoshop). 3. Sometimes ReSharper gets in a funky state and says my custom server controls are an ambiguous reference, even after I recompile my project. What's the fix for this? 4. Is there a way to turn off ReSharper temporarily? 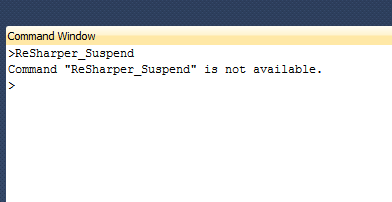 I used to use an alias mapped to ReSharper.ReSharper_Suspend, but that isn't available anymore. 5. ReSharper is saying align and valign are not valid attributes in table columns. I have been using those attributes for years. I checked w3schools and they don't have anything indicating that those are invalid attributes. Why are they being marked as invalid and what's the replacement? 6. I also have almost all my CssClass attributes show errors saying "unknown class some_class_name". Again, it's a valid class name, but I had to turn the feature off. color underlining in the editor? Caches button under ReSharper | Options | Environment | General)? error saying the hard-coded path (e.g. images were really missing in my virtual directory. project. What's the fix for this? For the aliases, I am using the following text in the command window (which fails when I run them). I've also noticed in the keyboard settings that the Resharper_Suspend command is not available to hook to a shortcut. Am I missing something? See the screen shot of the Add Command window in Visual Studio. 2. Could you please clarify if you want to disable color picker itself or color underlining in the editor? I would like the color underlining to be turned off. 3. Have you tried clearing ReSharper caches when this happens (use Clear Caches button under ReSharper | Options | Environment | General)? I will try this the next time ReSharper shows the server controls as ambiguous references. It seems to happens randomly. > (which fails when I run them). > or color underlining in the editor? > I would like the color underlining to be turned off. ambiguous references. It seems to happens randomly. • /ReSharper.Resume: Visual Studio command line key. Ensures the product is suspended when Visual Studio starts. 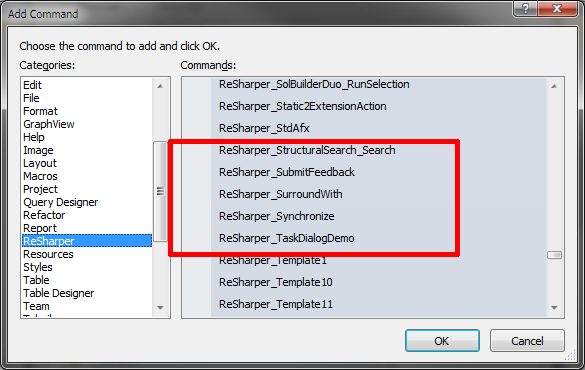 • ReSharper_Suspend: visual studio command. Suspends a running product. • ReSharper_ToggleSuspended: visual studio command. Resumes a suspended product or suspends a running product, depending on the current state. • With Visual Studio user interface customization, these commands could be added to menus, toolbars, or assigned a keyboard shortcut. "/ReSharper.Resume" is an invalid command. I'm assuming this was a typo. "ReSharper.Resume" does not work either. "ReSharper_ToggleSuspended" works and I was successful in creating an alias for it with "alias toggle ReSharper_ToggleSuspended"
May I ask what your resolution was for issue number 6? I am facing the same problem myself currently. Thank you! I currently use RS 7.1.3 and have no issues with CSS rules. I would advise you to upgrade to the latest version. I appreciate the response, though upgrading isn't an option for me currently. I had this working previously, but I had to do a reinstall of all my software and I don't recall the fix. I can turn off the warning, but the code inspection is interferring with the built in Visual Studio functionality for CssClass'es to display via intellisense. Very frustrating since it was working before! Under ReSharper -> Options -> Code Inspection -> Inspection Severity -> CSS -> Potential Code Quality Issues -> Unknown css class, I have mine set to to "suggestion". Well see, that is the thing really. There's no reason why it should even show up as a suggestion, since the CSS Class is completely valid and shouldn't be throwing an exception at all. If I disable ReSharper, Visual Studio recognizes the class perfectly and gives me a listing of all the CssClasses whenever I go to apply that attribute to an element. It displays just fine when I run the page, so there's something going on in ReSharper that isn't allowing it to properly recognize the CssClass or even make suggestions as to what it should be. In fact, if I click on it and 'Go to definition', it pops up the correct css file and goes to the definition as expected. I would guess it is a bug of some sort, but if I could get back to the point where I was able to work around it, that would be just fine with me. I don't want to disable ReSharper every time I go to pull up a CssClass, though that is looking like my only option currently. I thank you for your time.